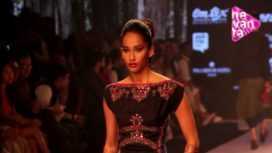 The confident, up class and party-going woman of today is depicted seamlessly by fashion designer Ridhi Mehra at the recently concluded Lakme Fashion Week Winter Festive 2015. Ultra-glam red carpet creations draped to perfection in varying hues sweep the aisles of the runway. Using the finest of fabrics such as soft georgette, chiffon, net, velvet and crépe, the designer has crafted semi couture jumpsuits, pleated skirts, structured kurtas, cape blouses, stunning gowns and dramatic separates. Shades of black, teal green, deep blue and crimson red paint the collection. Shimmering sequins and dori work create a 3D effect enhancing the look of the poetic range. The showstopper was the hot star of Jannat 2, Esha Gupta who looked sensational in a black embroidered gown and net trail. Catch the video and get dazzled. Ridhi Mehra is an Indian fashion designer based in Delhi. She studied Business Management from Nottingham, England prior to a course in Fashion Design from the National Institute of Fashion Technology (NIFT) in New Delhi. 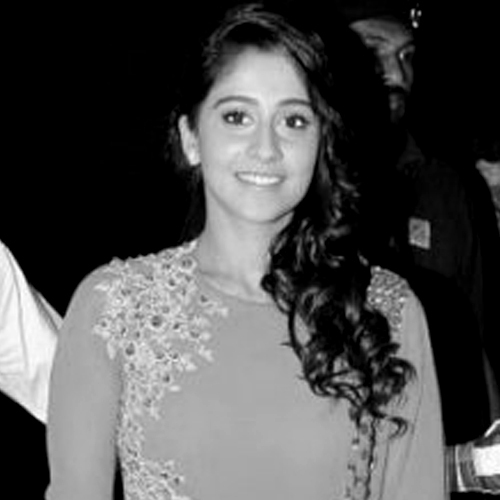 Mehra started designing under her own label ‘Ridhi Mehra’ in the year 2011. The label displays a clear love for vintage, imbibing European influences combined with traditional Indian aesthetics. It exhibits a mix of contemporary fabrics and a vivid color palette. Ridhi Mehra has designed for various Bollywood actresses including Deepika Padukone, Kareena Kapoor, Sonam Kapoor and Sonakshi Sinha.